But at least we can take hope in rebel athletes like Colin Kaepernick. Yet pro football has also provided us with the single most vivid image of current American resistance to racism. Last summer, before a pre-season game, San Francisco 49ers quarterback Colin Kaepernick sat during the playing of the national anthem, as a symbol of his refusal “to show pride in a flag for a country that oppresses black people and people of color.” As the season progressed, he started going down on his right knee when the anthem began, revealing that he was wearing black socks decorated with pigs in police hats. These, he said, represented “rogue cops that are allowed to hold positions in police departments.” He would eventually stop wearing them, convinced that the socks were a tactical mistake. 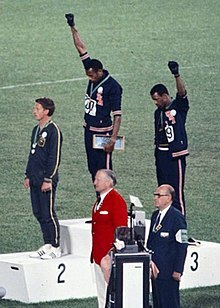 Kaepernick’s nonviolent gestures, done initially without fanfare, were the most powerful message from SportsWorld, since that other hard year of despair and determination, 1968, when two American Olympic medalists, Tommie Smith and John Carlos, raised their black-gloved fists in Mexico City. Incredibly, Smith, Carlos, and Kaepernick were all tutored by the same man, sociologist Harry Edwards. In the 1960s, as a young San Jose State professor, Edwards created the Olympic Project for Human Rights as his protest against racism. Now a retired Berkeley professor, he has been a longtime adviser to the 49ers. 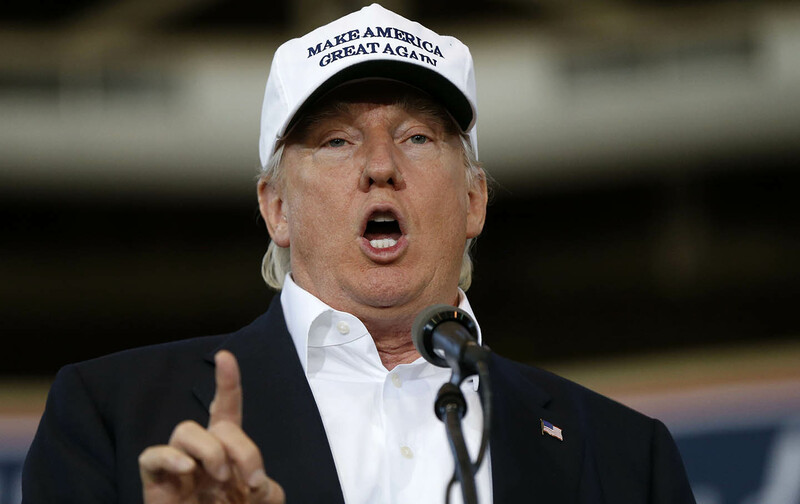 You won’t be surprised to learn that Donald Trump immediately disparaged Kaepernick’s gesture, telling a Seattle radio station, “I think it’s a terrible thing, and you know, maybe he should find a country that works better for him, let him try, it’s not gonna happen.” He then moved on, as he tends to do—perhaps because he was already bored or perhaps because it triggered a memory of his own disastrous pro-football days. Donald Trump is an old story for me. When I first began talking to him in the mid-1980s—I was then a sports reporter for CBS Sunday Morning with Charles Kuralt—he had just bought the New Jersey Generals of the United States Football League (USFL), then in its second year of operation. The USFL played its games in the spring and summer to avoid direct competition with the National Football League for fans and TV access, but did manage to bid successfully against the established league for a number of star players, including Herschel Walker, Steve Young, and Doug Flutie. In the course of our first long interview, Trump assured me that he was not a man consumed by his latest purchase. (“If the league isn’t successful, then, you know, it’s off to the next thing.”) He did, however, boast—he was already The Donald, of course—that his involvement gave the USFL “a little bit more warlike posture toward the establishment,” and that the “magic” of Trump Tower would enhance the image of the league. He insisted that he didn’t much like attention himself, but felt obligated to do this interview because I represented “a great show.” Even then, he spoke in the adjectival style (Great! Sad!) now familiar to all Americans. At the time, though I sensed that it was all mud, I was a journalist and at least it covered the ground. Typically, he had swallowed his own tail and who knew what he meant, including him? Through the 1990s, as the host of a local PBS public affairs show and then back writing columns at The New York Times, I watched his mean-spirited pomposity swell as he filled airtime and notebooks. But what more could a journo ask? I’ve thought about Donald Trump ever since—he did have that effect on you—and have come to realize that he’s an avatar of the worst aspects of jock culture. (He had, in fact, been a good high-school athlete.) His kind of boastful, bullying, blowfish persona is tolerated in locker rooms (as in sales offices, barracks, trading floors, and legislatures), just as long as the big dog can deliver. Which he has done. It’s no surprise that his close pals and business associates in SportsWorld include two other notorious P.T. Barnums, boxing’s Don King and wrestling’s Vince McMahon (whose wife, Linda, is now Trump’s pick to head the Small Business Administration). Another typical jock-culture trait is rolling over for the alpha(est) dog in your arena, be it the team leader, coach, owner, or even the president of Russia. One wonders, had Trump become a successful NFL owner, would he have wimped out as completely as New England Patriots’ owner Robert Kraft did when Russian President Vladimir Putin pocketed his Super Bowl ring in 2005 and walked out of their Moscow meeting room with it. It was never returned. Under pressure from the George W. Bush White House, according to Kraft, he claimed it was a gift, only to change his story years later. Kraft is a Democrat, while his coach, Bill Belichick, and his quarterback, Tom Brady, are friends of Trump. The Patriots, the best team of our era, will, of course, be playing the Atlanta Falcons in the Super Bowl. Putting Kaepernick in such a league may be a tad premature, but he has stimulated what might be called a Jock Spring, and not just because he promised to distribute his first million dollars in salary this season to community charities. Women soccer stars, high-school football players and their coaches, National Football League and Women’s National Basketball players all began going down on one knee as the national anthem struck up. Supreme Court Justice Ruth Bader Ginsburg called the gesture “dumb and disrespectful” before professing regret for her remark. 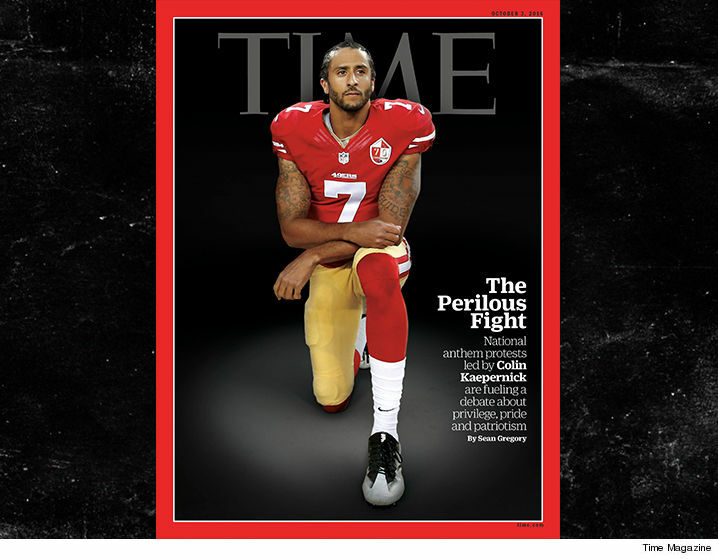 Time put Kaepernick on its cover. Trump blamed him, in part, for a decline in the NFL’s ratings. The initial signs of a Jock Spring actually predate his protest. Last July, New York Knicks forward Carmelo Anthony posted on his Instagram page an old black-and-white photograph of a dozen young black athletes in suits and ties posed in protest at what was then a summit meeting of sports stars. The front row of that 1967 photo now seems like a sports Mt. Rushmore—Bill Russell, Jim Brown, Kareem Abdul-Jabbar, and Muhammad Ali, whose heavyweight title had been stripped from him after he refused to be drafted into the military. Kaepernick’s most transcendent transgression has been the way he punctured the comfort of football’s sweaty sanctuary, letting in both light and some hard truths—including this reality: that objectified and extravagantly well paid performers can still have real thoughts about the world outside the white lines, a world becoming more and more perilous for those who think Trumpball should not be the national pastime. Trump has said he will not be attending the Super Bowl—that might even be true—but he will sit for the usual pre-game presidential interview, this year with Bill O’Reilly of Fox, which will broadcast on the holiest event of the sports calendar. Should you tune in? While we’re still a democracy, make your own decision. Do whatever you did for the Inauguration.